When you join the Wyndham Vacation Rentals team, you and your vacation rental property will benefit from our global marketing, advertising, and public relations strategies, which are designed to drive occupancy for our owners. Wyndham Vacation Rentals strives to increase consumer awareness and demand for vacation rentals through high-impact promotions, far-reaching media placements and dynamic activity throughout the U.S. and around the world. Once you join our program, your vacation rental property will be featured on our website showcased by professional photography and an immersive 3D virtual tour that allows guests to explore and visit your rental property before they even arrive. This not only helps guest visualize what there upcoming vacation will be like but it grants them the opportunity to see the floor plan and its amenities before they even arrive! Your property will also be marketed on our expansive networked affiliates such as Expedia and TripAdvisor, as well as online travel agents such as HomeAway & VRBO, increasing your exposure and significantly enhancing opportunities for maximized occupancy & revenue. Wyndham Vacation Rentals on Hilton Head Island’s guest app will be available to download on any smartphone device. Now guests can check-out online, explore and book properties, and communicate with our local staff with just a click of a button! Our on-site Marketing Manager is here to handle all of our local marketing campaigns, social media accounts, e-mail marketing and print advertising. 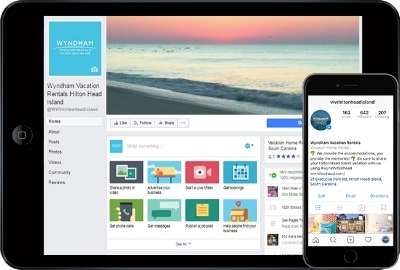 Our social media following for Wyndham Vacation Rentals on Hilton Head Island is the largest of any local vacation rental company on the island, which equates to even greater exposure for your property.